Posh defend a Walsall corner. Photo: Joe Dent/theposh.com. The result was bad, the manner of defeat was upsetting, but the ramifications of 15 crazy late minutes are potentially season-ending. 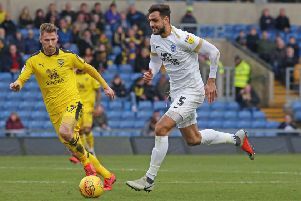 Peterborough United lost very little ground in the race between several pretty ordinary sides to reach the League One play-off places, but they next face two of their closest rivals with three first-choice midfielders on the sidelines. If Carlsberg provide perfect moments, this was an alochol-free lager of a day for Posh. Posh striker Craig Mackail-Smith bursts between two Walsall defenders. Photo: Joe Dent/theposh.com. The bare facts suggested they were unfortunate to lose. Posh’s toothless attack pitted against Walsall’s tactic of employing three centre-backs and one striker in home games led to a predictable stalemate until a traumatic seven minutes of added time caused mainly by a serious-looking late injury to midfielder Gwion Edwards. Posh ‘keeper Luke McGee promptly mis-handled Erhun Oztumer’s corner into his own net, captain Chris Forrester then showed more passion in abusing an assistant referee than he had for the previous 90 minutes as mis-guided claims for a foul on McGee were pursued, and Anthony Grant’s slip (he’d earlier collected his 11th caution of the season and a subsequent two-game ban) enabled Walsall to sneak a second goal their own labours had barely warrented through Kieron Morris. But Posh boss Grant McCann was in no mood for sympathy. The first question of his post-match press conference invited him to claim Posh deserved something other than a mass a headache from a poor game. His reply was illuminating, and hinted at frustrations that have been building up inside the boss as well as the fan-base. Match referee Mark Haywood leaves the field after Walsall beat Posh 2-0. Photo: Joe Dent/theposh.com. “We 100 per cent deserved to lose because of our ill-discipline,” McCann raged before a public condemnation of a captain whose form has collapsed since a quite brilliant display at Chelsea in the FA Cup led to predictions of a big-money move to a big club. Soem suspect that may well be part of the problem. McCann now faces a huge test of his rookie managerial career. He has selection and confidence issues to address just as Posh enter a potentially pivotal run of fixtures against play-off chasing rivals. It wouldn’t be the greatest suprise to find Michael Bostwick volunteering to risk his broken jawbone with the aid of a couple of pre-match Aspirin. McCann is trying. He threw together his 11th different strike pairing of the season in Craig Mackail-Smith and Junior Morias, but deployed them in a 4-4-2 system which probably doesn’t suited them, especially with Paul Taylor faling to match Edwards’ efforts on his flank. The manager also changed to a 3-4-3 formation for the final quarter in a laudable attempt to win a tight game, but, there was no response in terms of increased creativity or pressure. Posh did have a territorial edge against a side who were happy to exploit space on the break, but as McCann stated ‘if you can’t win a game, make sure you don’t lose it’. The back four played solidly enough for this to be comfortably achievable. McGee had also played well until his attempt to catch Oztumer’s set-piece under pressure from substitute Amadou Bakayoko went catastrophically wrong. Such is the life of a goalkeeper, one of the better performers in a misfiring team will be remembered for his one negative moment. McGee had conceded the corner making a fine block to thwart a former Posh midfielder who is enjoying such a golden season there was a rush to credit him with a goal that probably wasn’t his. McGee also saved well in the first-half when sole home striker Simeon Jackson beat Dominic Ball to a right-wing cross. McGee and Ball also had an unedifying public spat in the second-half after leaving a ball in their own penalty area to each other, a moment when team spirit was justifiably questioned by onlookers. Posh had their attacking moments. Two early deep Edwards’ crosses caused panic in the home defence when Mackail-Smith and Andrew Hughes headed them back across goal, with Forrester desperately close to bundling the first one over the line. Morias whipped a fine free kick just wide in the first half and forced Phillipines’ international goalkeeper Neil Etheridge into a decent low stop with a powerful left-foot drive. But they were shots taken from distance. Posh lacked the attacking cohesian and passing skills to force their way through a well-organised home defence despite the best efforts of Edwards. McCann, and the player’s many terrace critics, might just have to swallow Marcus Maddison’s indiscretions as he creates more than the rest of the team managed here, even when playing poorly. Posh: Luke McGee, Michael Smith (sub Lee Angol, 69 mins), Andrew Hughes, Dominic Ball, Ryan Tafazolli, Anthony Grant, Chris Forrester, Gwion Edwards (sub Martin Samuelsen, 84 mins), Paul Taylor (sub Marcus Maddison, 69 mins), Junior Morias, Craig Mackail-Smith. Unused substitutes: Leo Da Silva Lopes, Mark Tyler,Tom Nichols, Jack Baldwin. Walsall: Neil Etheridge, Joe Edwards, James O’Connor, Adam Chambers, Jason McCarthy, Kieran Morris, Isaiah Osborne (sub, George Dobson, 67 mins), Matt Preston, Eoghan O’Connell, Erhun Oztumer (sub Franck Moussa, 90 mins), Simeon Jackson (sub Amadou Bakayoko, 73 mins). Unused substitutes: Craig MacGillivary, Scott Laird, Will Randall. Kory Roberts. Goals: Walsall - McGee (og, 90 + 2 mins), Morris (90 + 6 mins). Sending off: Posh - Forrester (foul and abusive languages). Cautions: Posh - Grant (foul), McGee (dissent). Walsall - Chambers (foul), Jackson (foul), Bakayoko (foul), McCarthy (foul).